When your little one undergoes the transformation from toothless to sprouting a few developing teeth, they may become a bit cranky. It can be easy to pacify your baby with a variety of options, but your pediatric dentist in Bergenfield wants you to make sure these teething options are healthy for their developing smile. Use these insightful tips to help your child cope with the pain of their smile’s inevitable development. 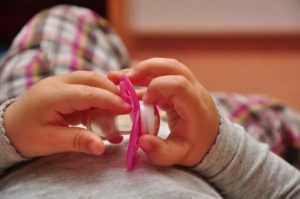 Baby product companies are very familiar with the teething period that every child must go through. That’s why they offer a variety of products for you to choose from. They come in all shapes and sizes to appear more attractive to your little one. Most of them can be chilled in the fridge, but don’t freeze them as they can shock your baby when you first put it in their mouth. You must be picky when you’re choosing the teething products for your child. There may be a few that contain BPA, a dangerous chemical that is banned from many baby products. BPA is an endocrine disruptor, which means that it can interfere with hormones and lead to developmental problems. Be sure to check the label! Sometimes, suckling on mommy or daddy’s finger may help relieve your little one’s pain. You can gently massage their gums by softly rubbing on them. The gentle pressure can take away some of the pain for a brief period of time. Cold foods like chilled fruit, yogurts, or even a smooth dip like hummus may provide a quick moment of comfort. Hard foods are like edible teethers because they apply just enough pressure to relieve pain temporarily. If you need more suggestions on which foods may be best for you to give your little one while they’re teething, feel free to contact your local office for more information. As a general rule of thumb, you should bring your child in to see their local kid’s dentist in Bergenfield as soon as their first tooth begins to erupt. This will help you to understand what you can do at home to make this period run smoothly for you and your child. Plus, your dentist will be able to examine your little one’s mouth to confirm that their mouth is developing appropriately. Feel free to contact your local office to get help caring for you and your loved one’s smiles—especially when they need help relieving their little dental discomfort. Here at Smile More Kidz, we know that every parent wants to give their children the very best—especially when it comes to health care. Your dentist wants to help you provide only the best for your little one’s pearly whites—even as they’re just developing. Contact us today to schedule your appointment!